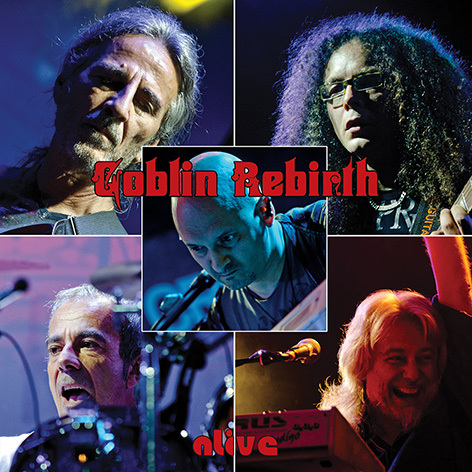 2015 sees no less than four variations of Italian RPI/horror soundtrack band GOBLIN active - new versions of both the original band and its previous incarnation as CHERRY FIVE, Claudio Simonetti's Goblin, and this group, GOBLIN REBIRTH. Two members who played on various Goblin related albums as far back as the mid Seventies, Fabio Pignatelli (bass) and Agostino Marangolo (drums), are joined by guitarist Giacomo Anselmi and keyboard players Aidan Zammit and Danilo Cherni, and this all new band carries on in the fine tradition of Goblin past and present. This is the entire recording Audio and Video of the 2011 concert in Roma including all famous and classic hits of Goblin plus some songs never played live before as “Buio Omega”, “Connexion” “La Chiesa” “Death Dies” “Witch” “Le Cascate di Viridiana”..